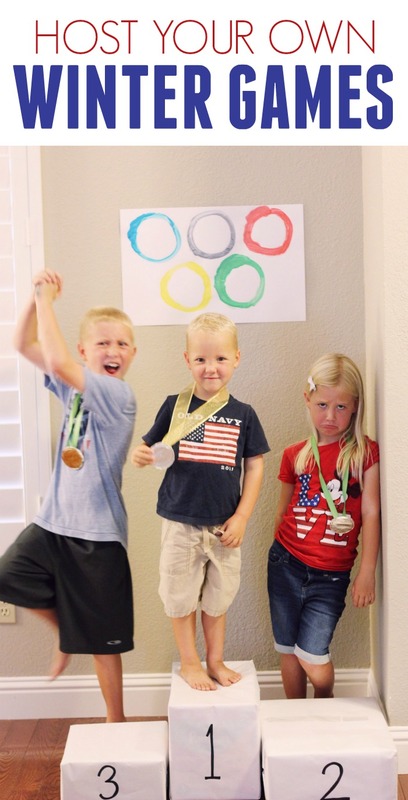 The Winter Games just kicked off and our family is really excited to watch and celebrate together! 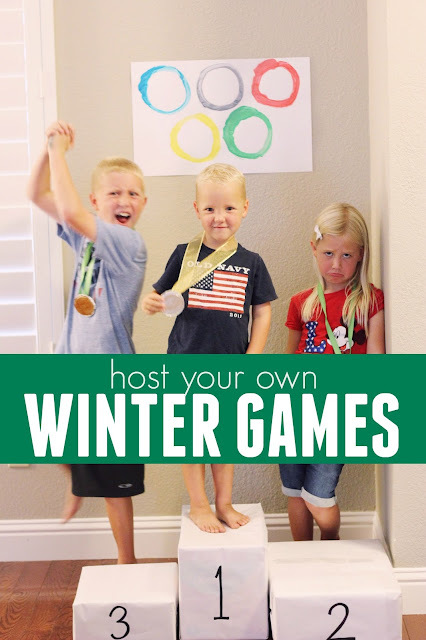 Each time the Olympics roll around, we love to get friends and family together to enjoy the games and host our own Olympics inspired family event. We have extended family close by, so we love to get everyone together and get the kids moving and having fun together! This year we are hosting our fourth family games and it has been fun to see how it changes each time as all of the families grow! This year we will have 17 kids participating (ages 11 and under) and 13 adults. It will be a party! Today I'm going to explain the set up for our Family Games and how it works so that I don't get overwhelmed and have to plan everything. Each family participates in organizing in some way! Once you've picked a date for your family (or friend) winter (or summer) games... you need to do two things. 1) Have each family pick the country that they are going to represent and select something to wear that goes along with it. 2) Have each family select an event that they want to organize. 3) Ask each family to bring some sort of games themed dessert item to share plus a favorite pizza topping. Our family usually represents the USA because we have American flag shirts from the Fourth of July that are easy to put on. Next, you need to put a plan together for your event. What are you going to do when people arrive? When are the guests going to eat? How's it going to work? I always like to have some sort of activity at the beginning of a party that is open ended and that you can start and stop easily without kids getting frustrated. Once everyone arrives, then we like to get started with the Opening Ceremonies. Each family gets a turn to march around waving their flag and showing off their outfit. Next, we moved onto a food related activity and made Olympic themed pizzas! Each team was given a bunch of pizza dough and they created Olympic rings on their pizzas (or just decorated them however they wanted). We also snacked on some healthy and not-so-healthy snacks while the kids created. While the pizzas baked, we got started with our first event! We have so many Olympic themed ideas pinned on our Olympic Themed Kids Activities Pinterest board if you need more ideas. After eating our pizza and wrapping up any other events, we end with an awards ceremony! Sometimes I buy a bunch of medals and sometimes I make them. The ones in the photo below are made from foil, tape, and playdough lids. They are so easy to make! Each kid goes home with a medal! We make sure to have an Olympic grandstand for people to stand on to receive their medals! Last time we filled some boxes with books and then wrapped the boxes up with white paper and added numbers on the front (see below), to make our grandstand. The kids looked adorable! Hosting your own Winter Games doesn't have to be hard as long as you delegate responsibility and have a good plan! We are having our 2018 FamilyWinter Games next weekend and I can't wait!